D-81925, Munich, Germany. Director Simone Horvatin. •	We are SUPPLYgoGREEN from Munich, Germany; we dedicate to promote environmental technologies and sustainable solutions worldwide. •	We are available to answer your questions in the following hours: Monday - Friday: 9:00 - 14.00 CET except for Spanish bank holidays (although many times we answer outside this time frame). •	We do not store credit card details; payments are processed via Paypal or Stripe. •	You can cancel the subscription to your profile whenever you want from your panel->edit profile->cancel subscription, your profile will expire, and you will lose all your data. •	We do DB backups, but if you mess up your profile can take few hours until we restore the DB. Hope doesn't happen! •	We LOVE our work, and we will try our best ALWAYS! •	We will remove all your data after 30 days if you do not renew, we will notify you by email before we delete it. •	We may change prices of your plan, but we will notify you before, so you can cancel if you are not interested. •	We reserve any right to cancel your site if the content is inappropriate. We will contact you before! •	We are not responsible for any possible data loss from hardware failure or natural catastrophe. •	We do not offer refunds. You are encouraged to familiarize yourself with your rights contained in the Sale of Goods Act 1979, Unfair Contract Terms Act 1977 and the Unfair Terms in Consumer Contracts Regulations 1999. If you wish to purchase any product or service made available through the Service ("Purchase"), you may be asked to supply specific information relevant to your Purchase including, without limitation, your credit card number, the expiration date of your credit card, your billing address, and your shipping information. You represent and warrant that: (i) you have the legal right to use any credit card(s) or other payment methods (s) in connection with any Purchase; and that (ii) the information you supply to us is accurate, correct and complete. You expressly agree that SUPPLYgoGREEN is not responsible for any loss or damage arising from the submission of false or inaccurate information. We reserve the right to refuse or cancel your order at any time for particular reasons including but not limited to product or service availability, errors in the description or price of the product or service, error in your order or other reasons. You expressly agree that SUPPLYgoGREEN cannot accept any liability for loss or damage arising out of such cancellation. We are always updating our offerings of products and services in the Service section. The products or services available on our Service may be mispriced, described inaccurately, or unavailable, and we may experience delays in updating information on the Service and in our advertising on other websites. You expressly agree that any such offer of a product or service does not constitute a legal offer capable of attracting legal consequences. By posting Content to the Service, you grant us the right and license to use, modify, publicly perform, publicly display, reproduce, and distribute such Content on and through the Service. You retain any, and all of your rights to any Content you submit, post or display on or through the Service and you are responsible for protecting those rights. You agree that this license includes the reason for us to make your Content available to other users of the Service, who may also use your Content subject to these Terms. You represent and warrant that: (i) the Content is yours (you own it), or you have the right to use it and grant us the rights and license as provided in these Terms, and (ii) the posting of your Content on or through the Service does not violate the privacy rights, publicity rights, copyrights, contract rights or any other rights of any person. The Service and its original content (excluding Content provided by users), features and functionality are and will remain the exclusive property of SUPPLYgoGREEN and its licensors. The Service is protected by copyright, trademark, and other laws of both the Germany and foreign countries. Our trademarks and trade dress may not be used in connection with any product or service without the prior written consent of SUPPLYgoGREEN. When you upload content, you give to SUPPLYgoGREEN a worldwide, non-exclusive, royalty-free, transferable license (with right to sub-license) to use, reproduce, distribute, prepare derivative works of, display, and perform that Content in connection with the provision of the Service and otherwise in connection with the provision of the Service and SUPPLYgoGREEN business. Our Service may contain links to third-party websites or services that are not owned or controlled by SUPPLYgoGREEN. 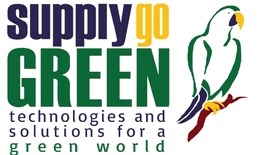 SUPPLYgoGREEN has no control over and assumes no responsibility for, the content, privacy policies, or practices of any third-party websites or services. You further acknowledge and agree that SUPPLYgoGREEN shall not be responsible or liable, directly or indirectly, for any damage or loss caused or alleged to be caused by or in connection with use of or reliance on any such content, goods or services available on or through any such websites or services. Upon termination, your right to use the Service will immediately cease. If you wish to terminate your account, you may just discontinue using the Service. You agree to defend, indemnify and hold harmless SUPPLYgoGREEN and its licensee and licensors, and their employees, contractors, agents, officers and directors, from and against any and all claims, damages, obligations, losses, liabilities, costs or debt, and expenses (including but not limited to attorney's fees), resulting from or arising out of a) your use and access of the Service, by you or any person using your account and password; b) a breach of these Terms, or c) Content posted on the Service. In no event shall SUPPLYgoGREEN, nor its directors, employees, partners, agents, suppliers, or affiliates, be liable for any indirect, incidental, special, consequential or punitive damages, including without limitation, loss of profits, data, use, goodwill, or other intangible losses, resulting from (i) your access to or use of or inability to access or use the Service; (ii) any conduct or content of any third party on the Service; (iii) any content obtained from the Service; and (iv) unauthorized access, use or alteration of your transmissions or content, whether based on warranty, contract, tort (including negligence) or any other legal theory, whether or not we have been informed of the possibility of such damage, and even if a remedy set forth herein is found to have failed of its essential purpose. Your use of the Service is at your sole risk. The Service is provided on an "AS IS" and "AS AVAILABLE" basis. The Service is provided without warranties of any kind, whether express or implied, including, but not limited to, implied warranties of merchant-ability, fitness for a particular purpose, non-infringement or course of performance. SUPPLYgoGREEN its subsidiaries, affiliates, and its licensors do not warrant that a) the Service will function uninterrupted, secure or available at any particular time or location; b) any errors or defects will be corrected; c) the Service is free of viruses or other harmful components, or d) the results of using the Service will meet your requirements. Without limiting the generality of the foregoing and notwithstanding any other provision of these terms, under no circumstances will SUPPLYgoGREEN ever be liable to you or any other person for any indirect, incidental, consequential, special, punitive or exemplary loss or damage arising from, connected with, or relating to your use of the Service, these Terms, the subject matter of these Terms, the termination of these Terms or otherwise, including but not limited to personal injury, loss of data, business, markets, savings, income, profits, use, production, reputation or goodwill, anticipated or otherwise, or economic loss, under any theory of liability (whether in contract, tort, strict liability or any other method or law or equity), regardless of any negligence or other fault or wrongdoing (including without limitation gross negligence and fundamental breach) by SUPPLYgoGREEN or any person for whom SUPPLYgoGREEN is responsible, and even if SUPPLYgoGREEN has been advised of the possibility of such loss or damage being incurred. These Terms shall be governed and construed by the laws of Munich, Bavaria, Germany, without regard to its conflict of law provisions. We reserve the right, at our sole discretion, to modify or replace these Terms at any time. If a revision is material, we will try to provide at least 30 days’ notice before any new terms taking effect. What constitutes a material change will be determined at our sole discretion.